Gabi Steppan - De website van bcc2016! I have been interested in dog sports for thirty-five years, during which time my dogs and I have studied and participated in almost every kind of canine sport. 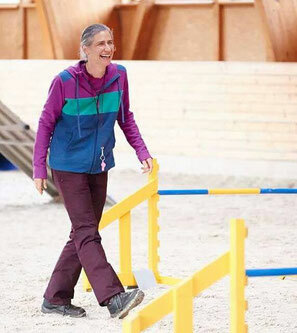 Fifteen years ago I became keen on agility, and during this period I have trained several dogs in large and medium classes, and have competed in many competitions at home and in other countries where I have come to appreciate and enjoy the company of the pleasant and friendly agility community. 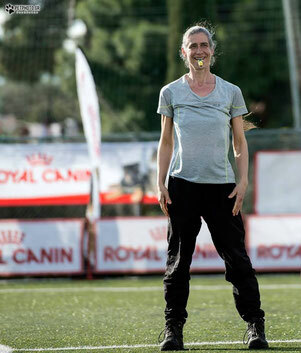 In 2007 I qualified as an Agility Judge, and since 2008 I began to judge competitions also in neighbouring countries and there were more and more until even invitations arrived from overseas. I am very proud that I got the chance to be a part of Agility history, even in small countries, where the sport is still young and small. Designing courses with the need to consider demands on the dog, the handler and the judge at all levels, gives me enormous satisfaction. I like to feel that we all, dogs, handlers, and spectators enjoy every run together. I believe that this mutual enjoyment is the heart of the sport of Dog Agility. The big Border Collie event in the Netherlands 2016 will be one of the highlights in 2016 and I really look forward to meet you all there!